It Can Play Two Octaves with Ease! The pennywhistle — aka tin whistle — is the most user-friendly wind instrument on the planet. Its six holes produce two full octaves using the same, straightforward fingerings in both registers. The pennywhistle is so simple that a child can easily master it. Yet it is capable of playing virtually any popular melody in a surprising range of styles. The pennywhistle is an ideal first instrument. The celebrated Irish flutist Sir James Galway got his musical start playing the pennywhistle as a youngster, as have countless other musicians, both professional and amateur. For years the pennywhistle was one of the best kept secrets of the Irish and the South Africans. But with the Celtic and World Music booms of the ‘80s and ‘90s, the cat was out of the bag. People around the globe discovered the joys of this delightfully expressive and inexpensive instrument. From The Titanic, to Bruce Springsteen and The E Street Band, to SpongeBob SquarePants, the sound of the pennywhistle is ubiquitous. It is part of contemporary pop music and living folk traditions. The pennywhistle is the sound of NOW. Don’t get us wrong — we like the recorder. But the recorder is actually much harder for a child to play than the pennywhistle. Even adult amateurs have trouble making some of the second octave notes on the recorder. But on the pennywhistle, students as young as eight years old can play in both octaves with ease. It Lets You Start a Marching Band for Just $7.50 per Student! The ease of playing across two octaves is where the pennywhistle completely outshines the recorder, making the pennywhistle the perfect instrument for starting a marching band on a shoestring budget. Even in an era of budget cutbacks, your students can still experience the thrill, pride, and discipline of marching and playing in a band. For just $7.50 per student, we can outfit your entire class with pennywhistles and instruction books. Make some homemade drums and presto, you’ve got yourself a marching band that will bring joy to your children and to your community. We recommend starting to teach the pennywhistle in the third grade. 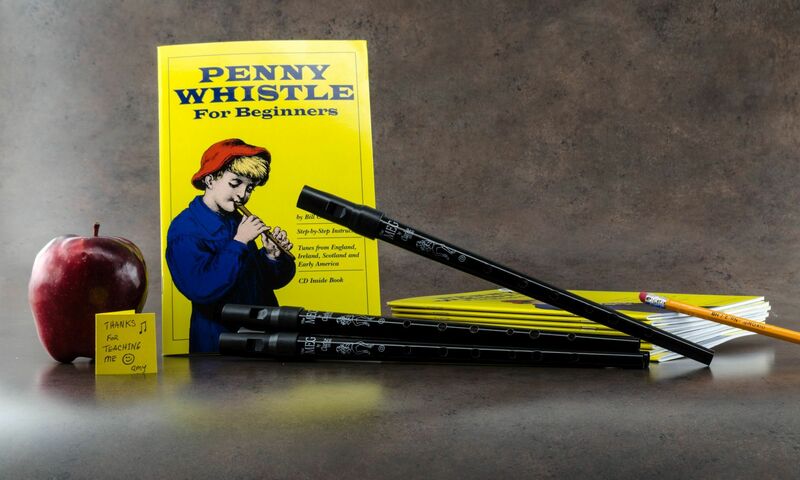 You don’t have to be a music specialist to teach pennywhistle basics and start a band with your students. The instructions in our book Pennywhistle for Beginners are so clear and easy to follow that any adult with some musical ability and an aptitude for teaching can do this. We’ll provide you with a free teacher’s guide and give you all the support that we can. To order pennywhistles and books for your school, group, or organization please click here. And don’t forget our free gift to you: download our free Pennywhistle for Beginners MP3 Media here.